SAVE THE DATE for the annual GSP Shareholders Meeting on January 27th at Daybreak Star Indian Cultural Center! This year’s theme will focus on “Telling Our Story.” Moving into the 14th year of our 20-year plan to restore our forested parklands, we want to educate more members of the community about the program while continuing to share with people the benefits and value of our urban forest. The program will recap and explore the past year’s increase in media requests and the program’s intentional outreach efforts, as well as provide information and guidance for program participants in telling our incredible story. More info to come regarding topics for the day on our website HERE. 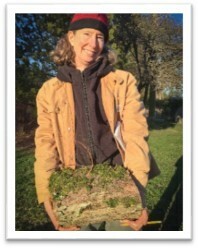 Lynda Mapes is the environment reporter at the Seattle Times and author of five books, including Witness Tree, published by Bloomsbury in April, 2017 about her year living with a single, 100-year old oak tree. She reports on the native and natural communities of the Pacific Northwest and the relationship of people to the land. She lives in Seattle. If you’re interested in attending the Shareholders Meeting on January 27th, please make sure to RSVP HERE to help us plan for a great event! If you invest time, energy, or funds into the work of the Green Seattle Partnership, then we consider you a shareholder in our success. Once a year, we take the opportunity to gather our shareholders together at our annual event to network with each other, share what we are doing citywide, report on the state of the Partnership, and delve into a pertinent and timely theme. Please join us this January for Shareholders at Daybreak Star, where weather granting we will make use of the outdoor pit for a salmon bake and lovely views of Puget Sound!